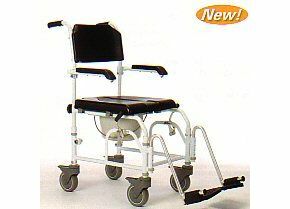 This durable three in one self propelled shower commode chair can be used as a shower chair, a commode chair or over a toilet pedestal. The non rust aluminium frame is height adjustable and comes with detachable height adjustable footrests. The seat is padded for extra comfort and features a removable section for easier personal cleaning. Handles at the rear of the chair make it easy if assistance is required. Padded armrests flip up and out of the way. The four swivelling front castors are 125mm (5") in diameter and are lockable. Supplied with a removable commode pan.